A rags to riches story, your story! It has been said that love like justice is blind. I disagree, “This poor man cried out, and the Lord heard him, And saved him out of all his troubles.” (Psalm 34:6, NKJV) I believe God looks at my life sees the flaws that disfigure me and because of His love and forgiveness they become transparent allowing His love to transform me from rags to riches. And out of the miracle of His love in spite of my flaws I become the “diamond” God sees me as. 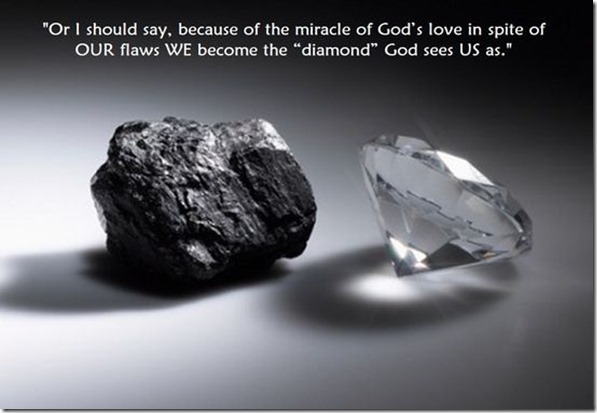 Or I should say, because of the miracle of God’s love in spite of OUR flaws WE become the “diamond” God sees US as. God’s love doesn’t stop with us instead it enables us to see, forgive, and love as God sees, forgives, and love. However, I would be remiss if I didn’t mention the difficulty we encounter when we see, forgive, and love as God does because as long as we draw breath our imperfections lie just below the surface. So for us love becomes a choice yet when we do choose to love as God loves us God blesses us. Scriptures marked NKJV have been taken from The New King James Version. (1982). Copyright 1979, 1980, 1982 by Thomas Nelson Inc. Used by permission. All rights reserved.